The purpose of this book is to enable Christian leaders to understand their psychological type, using the MBTI (Myers-Briggs) personality indicator, and to use this information to generate new insights into their own experience and performance. It will enable leaders to develop better strategies to maximise their strengths and to work with their recognised weaknesses. A significant amount of stress is experienced by Christian leaders. This book will help them to focus on those aspects of their work that are energising and life-giving. Part One of the book introduces the theories of psychological type and how these apply to Christian leaders. Part Two include detailed profile descriptions of each of the 16 MBTI personality types and explores the 'comfort zone' for that type and difficulties experienced by that type 'outside of the comfort zone.' Each type description is written with the role of the Christian leader in mind and covers aspects of their role, eg their experiences of worship, prayer, pastoral responsibilities, administration and working with others. 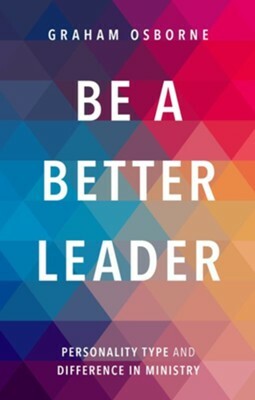 I'm the author/artist and I want to review Be A Better Leader: Personality Type and Difference in Ministry.